Feelwells probiotic dog treats adult. Everybody loves to treat their pets but it can be Everybody loves to treat their pets but it can be difficult to find high quality natural treats that are not full of artificial colours, flavours or preservatives. The majority of pet treat manufacturers are more interested in the appearance of their product for the pet owner, rather than the benefits for the pet. 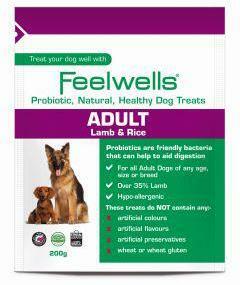 Feelwells Probiotic Sensitive Lamb & Rice Treats are a super premium, totally natural, hypoallergenic treat that you can happily feed to any dog and are especially beneficial to dogs that have food intolerances and suffer with digestive problems or colitis. Ingredients Rice, Lamb meat meal (min 35%), Maize, Sugar beet pulp, Brewers yeast, Chicken oil, Fish oil, Herbs, Probiotic. Analysis Crude Protein: 20%, Oil: 10%, Fibre: 4%, Ash: 8.5%, Vitamin A : 20,000 iu/kg, Vitamin D3: 1,750 iu/kg, Vitamin E (as alpha tocopherol): 150 iu/kg, Copper (as cupric sulphate) : 18 mg/kg Plus a full complement of B-vitamins and trace minerals.